Is it me or has this changed for the current races? Cards from the box at VOR is now 3 at a time, with 11 hours interval? This used to be 4 at 8hr interval. For the RORC and the clipper 4, I only got 2 coins per card. And I have the impression that I earn more VSR points. More than 400 VSR points for finishing about half way! (sorry, I took a gamble to go far north. Didnt work out.) In earlier races I got 70 points for finishing within 20%. I think it is an improvement. Less incentive to stay outside the finish line to collect cards for money, but instead finish the race early. - The difference between standard and Pro winches is already real. Without them, each maneuver slow at 50% for 300 seconds. With them, only 75. - AutoSail no longer slowdown when activating or deactivating it, but now it doesn't save speed in sail changes. At each change, 50% speed. Without winches Pro, 300 seconds. With them, 75. - Change the way to receive free credits. The repurchase of unused cards has a limit of 500 credits, by steps. The arrival bonus, according to the position in the ranking, has increased to 400%. The Barrel as you see. No money? You will have troubles. It's the idea. "The Barrel as you see. No money? You will have troubles. It's the idea." I like the effect that it is more rewarding to finish early than to stay outside and collect cards. Even if I don't have money, it is more fun. The buy-back cap is insignificant. 100 credits would buy you day's card supply at best. Running a business by making your customer's life miserable instead of easier is plain disgusting. I restrict myself to the minimum use of programmation, but that cost me last night with the tack a couple op nm. Sail at ATW 50 and tack to ATW 50 at approximately the right time is indeed sub-optimal. Well, I fully equipped my VOR3 boat without any strategic thinking from all the cards from VOR2, Clipper3 and Minitransat2. That is, with the old system, where 4 cards were given every 8 hours and had a return value of 5 coins each. The amount of cards to be gotten for free is really skimpy now. VR has a habit of changing many parameters at the same time so that they wildly overshoot their aim (if they are aware of one in the first place). So next time I will buy the full pack with great gratitude from Mr. Super. Well ..... not. Still a nice game however. I am not sure, but could it be that the number and frequency of the free cards can be depending on your VSR level? This makes the game increasingly harder once you get to higher levels. Does everybody get 3 cards? First barrel 15 minutes, second barrel 12 hrs, third barrel 11 hrs. No. It's the same for everyone. I have a VSR 14 boat and VSR 2 boat. Another interesting question is if the type of cards is random or predictably semi-random. I suspect it can be correlated but by the time we get the dependency there will be no more free cards left in the barrel. Nobody replied so I stopped communicating. For other races I got similar results. BTW, I am using very few cards, only WP and prog cards every now and then. I needed one more programmer card because I only got one left and guess what .. I got it. Luckily this is for the boat that has never seen a cent of real money. "Thank you for your message and please accept my apologies for the delay in our responding to you. 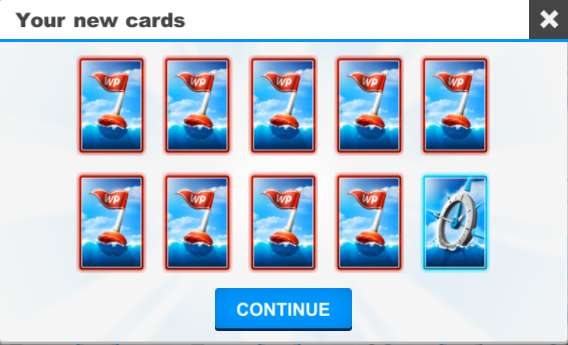 The unlimited navigation cards during Leg 3 was only unlocked with the purchase of the full pack. The full pack offer can only be purchased with real money. If you have further questions or concerns, please don't hesitate to let us know. I the cards you get are indeed dependent on what you need (NOT). Is the full pack ....value for money?? I wonder, why give free cards to the full pack people? and then next time....they will charge accordingly! My boat is not "full pack" (even the Big Bird, it's full options paid by winning free credits in RORC and Clipper and two VOR legs) The screenshot above is from the true no-money boat that I use for testing. The full pack is worth about 30 beers around here. A single programmer turn is worth 1 beer. That makes the full pack the only practical choice once you have decided to pay real money. Trying just to buy the cards needed for one race will probably cost more than the pack. But VR needed 3 months to realize that without cards included nobody would buy the full pack for 15 EUR exactly because you'd have to pay additional 15 EUR during the leg. Most of the time the discussion is not about the actual price, but about the attempt to hide the actual price and the bait-and-switch tactics employed. The rest of the time the discussion is about the demand curve sweet spot where many people believe that VR would actually have bigger turnover if they lower the price per leg 2-3 times. Has anyone worked out the way the 1hour card system works? Is the order now as random as it appears? And what triggers a clock reset? I assume there's some non-random logic, but it really annoying not understanding whether clicking on my cards is going to show me a running count-down, or find it's waiting for me to ask so that it can show me a set of cards I have absolutely no interest in! You click the card. A picture is revealed. It stays the same for 1 hour (or until you buy the deck). 1 hour passes, the deck is turned back to obscured position, you click it again and reveal (potentially) different deck. Or maybe you reveal the same useless Help card for the third time in a row, get fed up and leave the stupid game for good. Pity - I was hoping there was some higher logic that I had failed to understand - thanks for confirming that my intense frustration was fully justified! I just realized the cost to buy cards is the same regardless of the price of the full pack (ie, it's independent from the race category). That makes it even harder to find times when it's worthwhile to spend credits to do a race. Dubai-Muscat might require a bunch of cards to do well, and the full pack is inexpensive because it's a category 6 race. One would "spend" a lot more than the full pack price, in the value of the credits spent, trying to do well in that race. Oh well... I'm doing Dubai-Muscat with credits... Hopefully I'll be able to hand-steer enough of it to not burn through $20 worth of credits on cards. Yep. The full pack for Muscat buys you about 3 nav packs, or 7 programmed turns. Even with some luck and pure programmer cards the price is still 50c/program. I'm joining you in the Muscat race. Spent the credits on sails (and I'm on credits in the Clipper too) so don't have any program card yet and only 220 credits left.